Cook: It’s been a massive comedown for Latics! 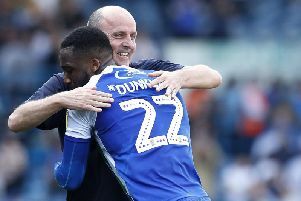 Paul Cook admits Wigan Athletic have had to cope with a massive FA Cup comedown to keep their promotion push on track. Latics, who yesterday discovered their FA Cup quarter-final clash with Southampton will take place on Sunday, March 18 (1.30pm), face a massive six-pointer in the league this weekend at Blackburn. Rovers have taken advantage of Wigan’s cup heroics by seizing control at the top of League One, and go into the game with a six-point lead – albeit having played four games more. “How can I put this...the FA Cup brings something to your club that’s hard to switch off,” Cook said. “It’s so glamourised, when you see the entourage that Man City and West Ham brought, the away support, the atmosphere. “There’s no way you can come away from games like that and feel the same – it’s humanly impossible. “All you can do is make a prearranged plan of what you’re trying to do, and stick to it. “The plan after Man City was simply to beat Rochdale. It wasn’t about playing particularly well.